Imagine naturally occurring toxic substances that are responsible for chronic disease and accelerated aging. When trying to discover why patients with diabetes are prone to complications such as heart disease, Dr. Helen Vlassara and her research team focused on compounds called advanced glycation end products, or AGEs, which enter the body through the diet. For years, these amazing studies remained virtually unknown to the public. Now, renowned researchers Dr. Vlassara and Dr. Gary Striker, and best-selling author Sandra Woodruff have written a complete guide to understanding AGEs and avoiding their harmful effects through the careful selection of foods and cooking techniques. Part One of Dr. Vlassara’s AGE-Less Diet clearly explains what AGEs are, how they enter your body, and how they contribute to the development of chronic disease, including diabetes, cardiovascular disease, kidney disease, dementia, obesity, and more. Most important, you’ll learn how you can reduce AGEs and improve your health by making simple changes in the way you eat. Part Two offers over a hundred taste-tempting AGE-less recipes that show you just how easy—and delicious—it is to follow an AGE-less diet. By lowering your AGE levels, you can reduce the potential of developing any number of serious disorders and enjoy greater health. 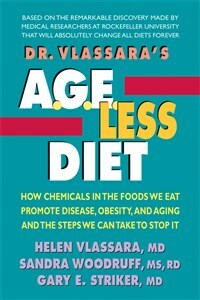 Dr. Vlassara’s AGE-Less Diet will guide you in making a real difference in your life. Helen Vlassara, MD, is Professor Emeritus and former Director of Diabetes and Aging Research at the Mount Sinai School of Medicine in New York City. She has devoted over thirty years to studying the effects of advanced glycation end products and has authored hundreds of scientific articles and books. Sandra Woodruff, MS, RD, LD/N, has a master’s of science in food and nutrition from Florida State University. She specializes in diet-related health problems, and is the best-selling author of many health-related cookbooks, including Soft Foods for Easier Eating Cookbook. - Gary E. Striker, MD, a Professor of Medicine and Geriatrics at Mount Sinai School of Medicine in New York City, has conducted research focusing on kidney disease and its complications, including the role that AGEs play in their cause and treatment.